Books is a brown bear with black button eyes and a black button nose. Embroidered on it’s chest are the words “Back to School” in purple thread. This version of Books wears a purple backpack. And I know you’re sure to pass! Books the Bear was introduced on 30th June 2005. 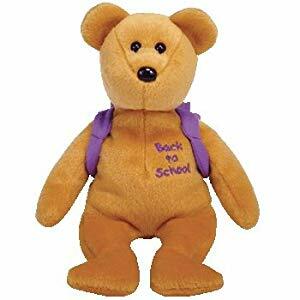 There are two other versions of the bear: one with a blue backpack and one with red. Books was retired on 26th August 2005.